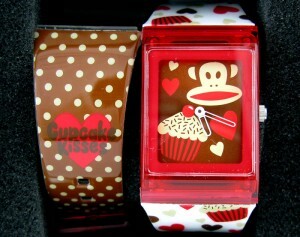 Paul Frank +Julius the Monkey+Cupcakes= WATCH Giveaway! By GreenEyedLillies on January 2nd, 2009 . Filed under: Accessories, Contests . Designer PAUL FRANK with adorable JULIUS the MONKEY and CUPCAKE KISSES and TWO interchangeable watchbands – $49.99 retail value-but yours FREE! Ready to make your wrist super cute with THE CUPCAKES CLUB?! Leave a comment here at The Cupcakes Club (gotta sign up to be a FREE cupcake member first)!! Good Luck, Cupcake! Winner announced on 1/6/2009!!! « CLUES for CASH GIVEAWAY! WIN $100! Only from The Cupcakes Club! 4 Responses to Paul Frank +Julius the Monkey+Cupcakes= WATCH Giveaway! So cute giveaway! I am really waiting for it. how do I joing the cupcake club? !